Discussion in 'The Locker Room' started by xoxodede, Feb 10, 2019. Came in this bytch thinking, "Not da homie Booker T ". Glad to see it was just this fukk nikka instead. Trav and #Championships dapped this. Op and tariq nasheed are agent trolls. he said to empathize with white people who want to ask about how racism works and whats offensive to us. Then he pointed out when he had to ask a gay person the same type of question about whats offensive to gays. I find it very interesting that new black media spends most of its time. shyting on the only black people running, trying to spin everything the black candidates do in a negative way for clicks and likes. so you think they don’t know how their own system works and that black face is offensive to us. Noted. Kowboy, richaveli83, Deuterion and 2 others dapped this. Your name is “Judah” that’s literally where the word Jew comes from, you fukking idiot. Where did OP say Corey Booker said we should empathize with white people wearing black face? A great deal of them think we're that stupid. He has no answer for you. richaveli83, loyola llothta, AggieLean. and 2 others dapped this. a lot of white people are really clueless and naive bruh. Been blessed to have the ability to travel all over this country and world and seen and heard some shyt. Lots of cism indeed but a lot more stupidity than I thought. Deuterion, Wild self and Indiglow Meta (R$G) dapped this. this too....way too much unfortunately. richaveli83, Indiglow Meta (R$G) and AggieLean. dapped this. Dwayne Taylor The open palm or the closed fist? 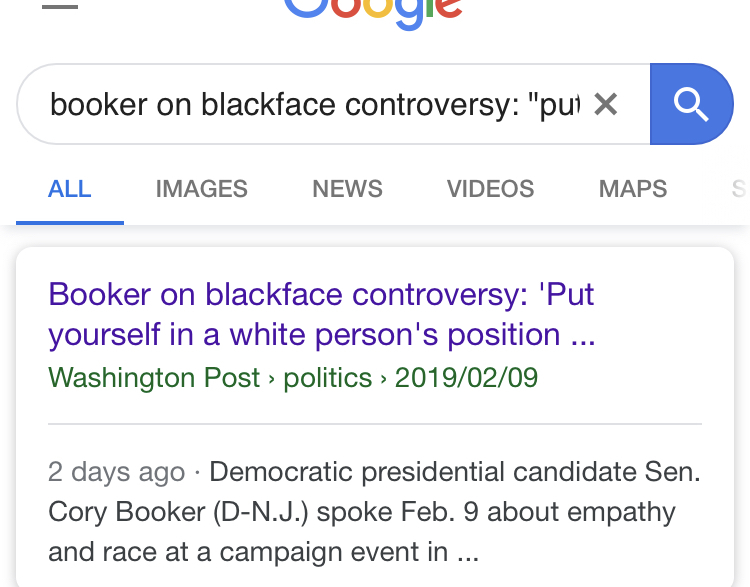 the washington post headline reads as follows : "Booker talks need for ‘honest conversations’ on race"
richaveli83, Indiglow Meta (R$G) and Caprisun dapped this. richaveli83, loyola llothta and #Championships dapped this. richaveli83, loyola llothta, Rekkapryde and 2 others dapped this. Context made it worse. Why are you responding to a "bot"??? Is my AI that powerful? @Dwayne Taylor you call men liars? richaveli83 and Caprisun dapped this. he wasn't talking about blackface specifically. He said said white people should be able to ask about whats offensive. Emotions, you're appealing to them.